Belle On Trend: Lululemon Align Leggings-- 3 Ways + a Fleecey Cardigan you NEED! 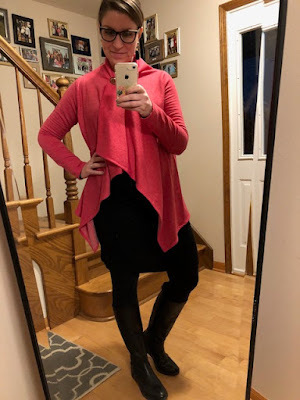 Lululemon Align Leggings-- 3 Ways + a Fleecey Cardigan you NEED! I am definitely guilty of finding a product/piece of clothing that I love and fits perfectly, and then buying it in various colors. LOL. I do this a lot, but since I know it fits, and I love it, why not? Then, I don't have to even go into a store (which is lovely for being pregnant and less mobile/always tired). Enter: the Lululemon Align leggings. I am obsessed. I can't say enough about the comfort of them! They feel like buttah!!! I now have a purple pair (capri length), and then a blue and garnet of the ankle length. Now there is even a full length pair, too! I am 5'6, and the 25 inch pair is very close to being full length on me, FYI. Just bought this "Do the Twist" Lululemon tank in the navy color, and I love it. It is currently on sale for $39! 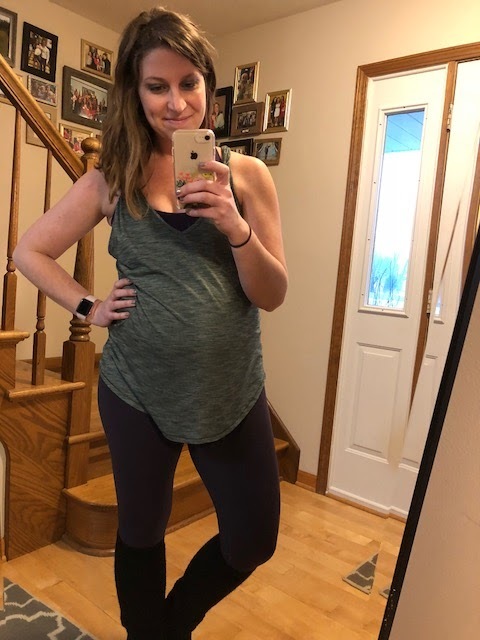 I'm in a size 8, and it fits nicely with the bump for Pure Barre class! It is great because it's long enough to cover your bootie, too! These purple ones are a size 4 from the summer (pre-preggo). I suggest sizing down, as they do run a little big! These Aligns are the 25 inch style! My blue and garnet pairs are both size 6. 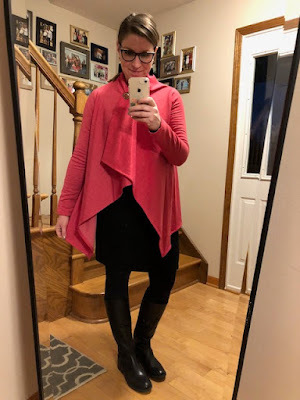 And here is the fleecy cardigan I can't stop raving about! My cousin wore her black one to Thanksgiving, and we all got hooked. After that, my mom and sister both bought one. Ashley, my cousin, actually got hers at Costco! But, if you aren't a Costco member, you can find it at Nordstroms on sale for $39! FYI: they do run a little big. Both of mine are mediums! It comes in 12 colors, and I am not exaggerating when I say it is the coziest piece of clothing I own. The inside is fleece-lined! My vest is a few years old from J. Crew Factory. Also, I like to wear it under my coats these days when it is super frigid outside. It no longer zips-- haha-- but it is sooo cozy. I just threw this cardigan over an LBD for work last Tuesday. I got so many nice compliments about it! Here's the Bobeau fleece cardigan in "Heather Red Mars". Ob-sessed. I made my coworkers feel the inside of it all day, and they can attest to its comfort! 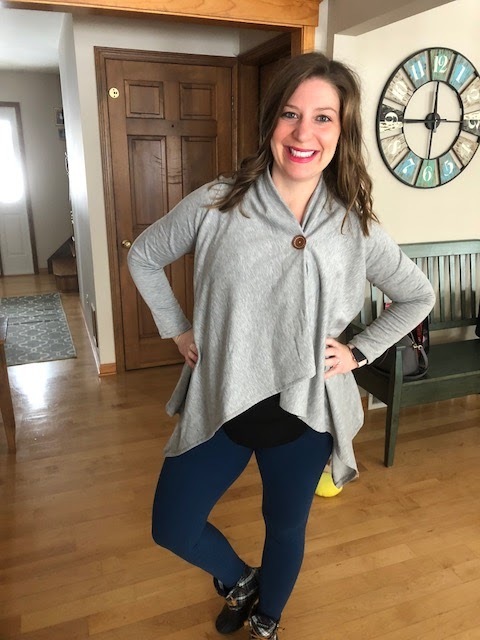 I have worn this cardigan everywhere: Pure Barre class, mass and even to work. It is going to be a workhorse in my closet. Wanting to get the teal, navy and camel colors next! What are your ride or die pieces in your wardrobe? Are you like me, and buy a bunch of colors of the same pieces? I hope you have a wonderful start to your week! It's been sooooooooo foggy in Chicagoland today!!! But, tomorrow's high is 54-- what?!?!! Hello cutie! 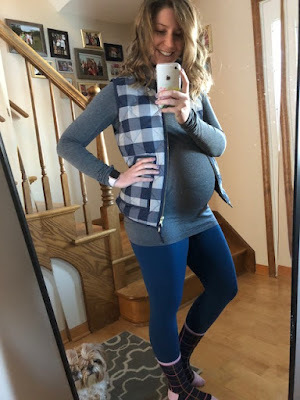 Those fleece cardigans are amazing and thinking I need some Sperry boots! Hope you’re doing well! Looking soooo good mama! 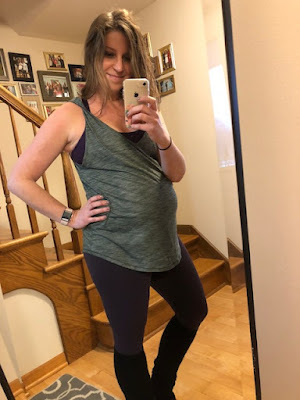 Oh my gosh, girl, you will love them!!! You will totally be addicted. 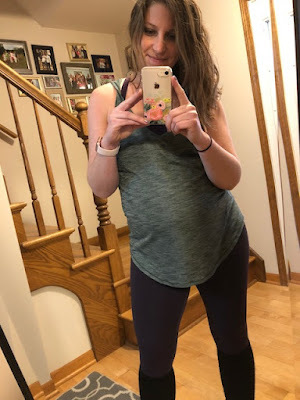 They’re so soft and comfy & literally the most flattering leggings known to man! Thanks for reading, Lauren!! !